It's too much to take in, and certainly impossible to write about. We'll turn to waste. A couple of months back I noticed the best possible name for a water main & sewer business. I'm going for the Staple Singers here, but if you were so inclined you could opt for the Ramones, T. Rex, or even Cher! And then there's this one. I saw the truck as I was crossing Fourth & Pacific, and only got a picture as it sped into the distance. 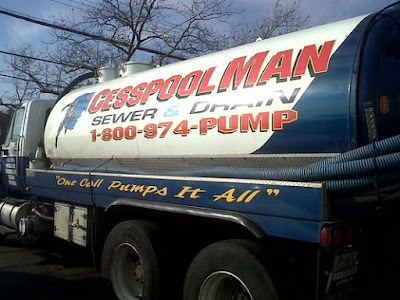 Cesspool Man. It doesn't have much of a groove to it. He wouldn't get a song from Marc or Mavis, but he does make a pretty nice Broad Channel superhero. "One Call Pumps It All"